I'm a fan of Lion Brand Yarn on Facebook. And I get their blog updates in my RSS reader. Why is it that I'm just learning today that there's a NYC store for Lion Brand Yarn? Back when I first moved here I scoured Google looking for a Michaels-type place (none on the island, but I have found one trekkable in Queens) and for yarn stores. This one didn't come up (although now it's visible on Google Maps). I wonder when it opened?! I just happened to see a blog post that used a picture of the store and mentioned that it was in NYC. Huh. I finished a project that will be unveiled around Christmas-time. I'm working on a sweet green Tiramisu baby blanket. I intend to donate it to my church's craft fair. I also want to whip up some thread snowflakes and flat angels for the fair too. I need to get busy. I talked to Gran today and I would probably be a happier person if I did speak to her daily. I called after my mom e-mailed me pictures of Gran's latest crocheted blanket (finishing someone else's work ... and something I helped her figure out when I was in OK last month - the pattern wasn't super clear AND the original crocheter didn't exactly follow the pattern!). Gran thought it was pretty funny that I could see the pictures the day after they were taken. I was planning to try to man up and go to the gym, but my head hurts too much. AND Gran's advice, like Shawn's, was to drink lots of water and rest. The resting sounds pretty good right about now, and I'm keeping up with the water ... as the worn spot in the floor between my desk and the bathroom can attest. This time I was turned away from donating platelets. I am not too disappointed, but it's frustrating to block out the time, get to the center, wait, be pricked and then they say I'm ineligible. Usually it's been anemic/low blood iron (a couple times when donating in Maryland), but this time it was my pulse. Her first count was 110, too high. Then she had me sit for probably 10 minutes and took it again. (I told her it wouldn't change ... as I wasn't winded and actually felt just fine/calm/not nervous.) She didn't tell me what the second count was, but said it would beat really fast and then go vague, like she couldn't feel it for a bit before it was racing again. She thought maybe I was holding my breath. Maybe I was, but not intentionally, and after she told me that she said I couldn't donate (instead of taking my pulse while I paid attention to how I was breathing). She also didn't take into account that she had me pull my right arm across my body and that she was pressing it into the side of the desk so hard it made an indention in my skin. Whatevs. I feel fine and actually suspect it had something to do with the 1/2 coffee I drank with a bagel on the way to the center. I have been intaking far less caffeine than normal for me, mostly for personal plumbing reasons, but I imagine the caffeine impacted my heart rate. I didn't offer up that explanation and just packed up and left. Blech. It took me over an hour to get home because instead of walking to the subway I took the closer bus, which meandered and had to go around a street festival. Plus it's raining, which makes everything worse. On the bus I had time to think ... and think ... and think. I have been listening to Brad Paisley on my iPod lately -- some of his songs are so incredible upbeat (The World, Alcohol) and others are so very sad/sentimental (When I Get Where I'm Going, Then, Oh Yeah You're Gone). So that added to the reflective quality of the ride. In the sermon (hands down the best one so far from this new pastor), she challenged us to always pray for people we meet and see -- to pray for the city as a whole and all its people. I really like that and find that I especially pray for young women crying. The bus ride was a good time for saying those prayers surrounded by all kinds of people. I've got crocheting to do and DVR'ed TV to watch. The sermon also got me thinking about my (hermit) lifestyle ... but this afternoon I'm going to let myself enjoy it. Thanks to a perfectly timed shared blog post, I found out today was the Smithsonian Museum Day - a lot of museums offer free admission. We picked the American Folk Art Museum, since we'd heard about it on Friday at a party. It was a cool museum, what parts of it were open. There was even a Titanic replica in metal that was made around the time the ship was built (1912-1915). Admission was free even if you weren't with the Museum Day because most of the museum was closed for an installation (including the yarn section, which I just assume they must have ... based on the gift shop). Bummer in the summer, but it was something to do and getting out is always a good thing. I got back from DC yesterday at about 6 pm, and we went directly to the aforementioned party. It was in a 34th floor apartment on 86th and 3rd. WOW the view south. I told Shawn if we could have a view like that it would almost make staying in NYC seem palatable. ALMOST. The party was for a visiting lecturer and there were about 20 people in a very small living room without enough seats for everyone. As the evening progressed (pizza, wine and assorted nibblies), the room got increasingly hot and stuffy. After three days in the office, with travel, the event on Thursday and my general nature, I was chomping at the bit to leave after just over 2 hours standing talking to people. Most of the guests were fascinating, easy to talk to and just nice. (I tend to like mathematicians, as you may have guessed.) There was also a guy who reminded me of Kahn from King of the Hill (ah, second Mike Judge-project mentioned in a week!) ... basically the guy was laughing at Shawn and me and trying to be sly about our "red neck" ways ... Perhaps it was just a cultural thing (he didn't say red neck, which is a signature of Kahn on the cartoon), and he is new in NYC/the department. But it was a bit off putting to be present for someone trying to belittle my beloved. As we took off (my excuse and apologies to the hostess being centered on the truthful fact that I had been away and traveling all afternoon), we were invited to take a look at the view from the roof. So we went up there, where it was nice and cool. A crisp gorgeous night - we could see Staten Island it seemed. It was all so beautiful - and there was much more seating and a better temperature up there. I would have been able to stick it out longer if we'd been on the roof. Shawn and I spent a few minutes up there before taking the ride back downstairs and going back to our nest here in the Village. I won't talk too much about work, other than to say it was a pretty good visit overall work wise. The event went well and I didn't come home on Friday to any urgent or upsetting emails. The ride home was MUCH better than the last one (after a crippling faux pas, which consumed my thoughts and still upsets me if I let myself dwell). I did have a coworker express feigned concern about me not getting out enough -- it was a really weird catty remark that I'm sure I took more seriously than it was intended. I feel worse about my close-knit lifestyle when having to try to explain it than actually living it, but there is some truth to the need for a more "normal" work lifestyle. Em to the eh. Meh. Church and plasma donation tomorrow. (The last scheduled appointment had to be re-scheduled due to ... let's say technical difficulties on my part involving a trip to a Duane Reed walk-in clinic and a three-day course of cypro ... but I'm all good now.) Dexter starts tomorrow night - the first time we'll be able to watch the episodes as they're released. I also may spend some time working on my website and exploring the idea of transferring this blogspot blog to a self-hosted wordpress blog. Not sure if I have enough web storage on my site though, so we'll see if I get anywhere. I also need to get on the ball re: the IUMC website and such. I should be packing. I should be making dinner. I will soon. Just got finished working out ... or what counts as working out for me. I'm doing my best to get in a routine, so that it becomes a habit that I'll miss when I don't get to do it (like tomorrow and Thursday when I'm not here). Just the walk to the gym, 20-ish minutes on the elliptical at varying speeds, getting heart rate up, and then the walk from the gym. It's enough to get me sweaty, which isn't exactly hard to do. Re-read a Marie Claire (yes, it's come to this - re-reading crap-tastic magazines) and actually read some of the longer interview type articles, including the one about the Olsen twin. She is so funny and entitled. She talked about how when she and her sister went to NYU they started the craze of carrying a Starbucks cup. That made me laugh - almost off my machine. Well, Shawn's home. So I guess I should get started on dinner. Don't worry about him while I'm gone - there are a plethora of cheap eats around us (many of which deliver) ... and I had a Fresh Direct delivery today so he's set with sandwich goods and other quick eats items should he choose to cook at home. Packing, eck ... but tonight: DiNozzo! and have them deliver some Pepsi." That line, from Extract, made me laugh so hard that the girls in the row behind us started laughing at me. I don't know what it was - the accent, the absurdity ... Shawn swears I laughed because I think it's a fine idea to have soda delivered by the pizza place. Seeing the movie on Saturday night was a much needed break this weekend, which was a working weekend to put it mildly. I upgraded my iPod software - which screwed up all the music and things. I think I got it all settled, but geez what a pain. I did it while watching House (omg, I could write entry after entry about TV shows, but I figure there's enough of that w/o me attaching my name to it, but I do want to write DiNozzo!) ... so it took a bit over two hours. Working out is still trudging along. It's not a habit yet, but I'm forcing myself to go. We'll see how the time away for work will affect it. My eyes are acting crazy again - red/bloodshot or whatever. I should get more sleep and have less stress. Uh ... summer's over so I don't envision that any time soon. I'll keep on trucking. This is absolutely just a journal entry - about me and what I've been doing, which basically is not much beyond work. (So it's less writer's block than life block I guess.) I haven't even really been reading anything beyond magazines, although I have one book review to type up. I also have hibernated most of my crochet projects - not sure what's up with that but I intend to take the green blanket Tiramisu pattern with me on the train ... yeah, I have to get up in the middle of the night again on Wednesday (5:45 a.m. feels like the middle of the night for me). So this is this. Until another day. NOT about the reality show, although I did watch one season of that - maybe the first - whichever one had the smarmy handsome doctor guy who won - Eric? No, I think it was Will. I wrote yesterday about Owen's pretend brother, but today I've been thinking about BIG BROTHER, and not just the government. Oklahoma State University, my alma mater, must have a bug in my apartment or something. Or maybe someone at the OSU Foundation or OSU Alumni Association reads this blog and figured out my updated address. Because without me updating it, they were able to send the OSU Magazine to my new address. But the even weirder part is that the magazine comes addressed to SHAWN! He said I should call them and get it corrected because he doesn't want anyone (including the postman) to think he is affiliated with the sticks. Uh ... Go Pokes?! Then there's Facebook. I probably would not have made it out of my teen years had FB been around then. I mean, seriously?! The Big Brother aspect comes in the suggested friends. That feature comes up with some astounding results - suggesting someone I actually know ... although there's NO WAY FB could know I know them in real life given what data we have on our profiles (and no shared friends). Really creeps me out. Google Images is getting Shawn - when you search his name one of the images that pops up is from our wedding site, which leads indirectly to my website, which leads to this blog. Egads! He's taken great pains to keep our online footprints separate. I changed the website with the image, but Google forgets nothing. I just hope it eventually bumps down so it doesn't appear on page 1 of the Google Image results. I am a gold mine of information about Shawn though ... so maybe I should think about scrubbing this blog and/or the site. That would make me sad though, so we'll see. But on the other hand, I lay it all out there. There are lots of details about me that can be pieced together from Facebook, MySpace, my website, this BLOG, etc. I like this record of me though, and I like that my family (by birth and marriage) can look at what I'm doing at their leisure. But I don't write about work at length. I may have written my organization's name in the blog, but I try not to. I sometimes gripe in Twitter, but I generally keep it unspecific and sometimes it's about working conditions (slow computer or construction or something in the apartment next door). This week's work especially has worn me out. But if you want the deets, it will have to be over e-mail. Shawn wore his jacket for the first time today. Other than that, I have absolutely nothing to report. Dur. These are really random thoughts, and quantify just how much I need to get out more. Seriously. Went to the gym today for the first time in ... months. They have all new equipment, which is pretty cool. The ellipticals have plugins for iPods. Hilarity. Of course I pick the day that they're having "club day" at the gym - the entire basketball court (all three regulation sized courts) were covered in tables and students signing up for this and that club or fraternity. There was even a line to get into the gym - but the actual workout areas were pretty sparsely populated. On the walk TO the gym I saw a guy washing his SUV. For one thing, it's kind of rainy in NYC. For another, he was washing it WITH BOTTLED WATER. I swear, he had a case of water and was pouring a bottle on the roof. Maybe it was just rinsing off some bird poo or something from the case he had just purchased or something but it still made a crazy picture. While I stretched I overheard a conversation by the fencing team coach and two captains - about some girl who probably wouldn't make the cut, and even if she did she wouldn't be allowed to travel with them. It was pretty weird. Now I'm hungry and Fresh Direct doesn't come until tomorrow because I was lazy about placing the order. Groceries for the weekend and beyond though, so there's that. I miss my that kid Owen! UGH. I should try a proper post tomorrow. Just not a lot happening beyond work stress. This feeling after being home in Oklahoma ... the ache. Wanting to hug a little boy and kiss his face. And hear his laugh - even his whine. It really stinks. The trip back from Lawton to NYC was overwhelmingly negative and hassle-filled. First our flight out of Lawton got canceled - no explanation except something about the plane not making it from Dallas. (Weather was fine.) A long line and people at the front just yukking it up w/ the 3 customer service reps who were working to re-book people on later flights. If we'd done that, we'd just be arriving now. Instead I called the 800 number while I stood in line and booked tickets on a flight from Wichita Falls to Dallas. 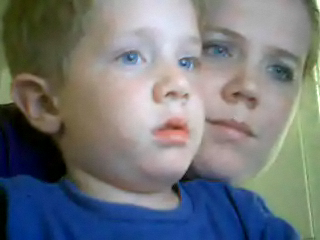 WF is just about 30-45 minutes on down the road from Lawton, but still extra travel time for my mom, sister and Owen. Instead of flying into LGA we had to take a connecting flight to Newark, NJ. The first flight from WF was in a small prop plane. The security at their airport was embarrassingly podunk. They take their jobs very seriously and individually asked everyone about liquids and laptops TWICE before we could even get in line. Then the flight was full of novice travelers who had to be told to take off their shoes, everything out of pockets, etc. There was also a lot of crying because there's an Airforce base nearby and several girlfriends were put on the flight. Anyway, we got on the flight and on our way. It was a REALLY bumpy ride. So much turbulence (b/c those small planes fly so low) that there was no drink service and we all had to stay seated the entire time. No problem. BUT there was a (seemingly pregnant) lady who lost her lunch (or vom-dot-commed if you will) on the descent. So much that it overflowed the puke bag onto everything and delayed deplaning. She was crying and everyone felt so bad for her. What could have been a really short layover ended up being about 30 minutes, enough time to transfer terminals and get a sandwich (although neither of us were super hungry after seeing the puke on the plane). Shawn and I weren't seated together, but we were close enough that we were able to get someone to switch so we could sit together for the 3 hour flight. It turned into about 4 hours on the plane because of a loooong delay b/c of an air system check. They weren't very open with the updates. The only time I took a cab from Newark it took a long time and was pretty expensive - and that was WITH the driver doing a short cut to get around the Holland Tunnel line (residential streets to the front of the line). So we didn't really want to chance it and thought the NJ Transit train would be a safer bet. After getting our checked bag, a $15 ticket each, two AirTrain trains to the actual rail station and over an hour after the flight landed, we're on the platform ... waiting for another train to get into NYC. It was either 12 minutes late or 20 minutes early, but our wait was tolerably short and the ride to Penn Station wasn't TOO bad. Then a taxi from Penn Station was quick because by this time it's getting close to 2 a.m. on a Monday night, so not many people are out and about (although more than you would imagine). Finally home and get inside - turned AC on and no surprises other than the expected sour milk. I'm still exhausted from fewer hours of sleep, but hopefully I can make it up in an earlier bed time tonight. There's no real moral of this story, although avoid Newark airport if you can. And American Airlines is on my sh*tlist (no other way to get to Lawton though so no sense having a tirade or meltdown). This should complete the quintet of computers from which I have blogged this week: Beth's (now), Mama's laptop, Mama's desktop, my laptop and Shawn's laptop. 5. So there. Today's my dad's birthday - happy birthday. We swam for two hours today so everyone is exhausted, sun sick (but not sunburned!) and more than a little crabby. Shawn and I have a big day of travel tomorrow. Then it's straight back into the grind. We land in NY at 10 pm if all goes well, so home by 11 ... knock on wood. I should be recovered by the weekend, and thankfully it's a short work week. Great Aunt Norma Lee turns 80 this weekend (Monday). My dad's birthday is tomorrow, so this has been a trip of birthdays. Wahoo! Mama is making us sketti, and Owen is being his most precious self. I think we're both coming down with a little cold, but hopefully it wont be too bad. Today we had the birthday pictures made, and he was a little stubborn about giving a genuine smile. He's cute no matter what though. I've been having a weird neck ache thing that comes and goes. It's always something with me, right? Enjoying the time off but will be nice to be back in the city and working efficiently. But I could get used to this human interaction thing. HA! Today is rainy, so we probably won't get to swim, which will probably lead to another meltdown (last night it sprinkled, so we didn't get to have our third day of swimming ... here's hoping it clears up this afternoon). Launch! - see how poor Bubba lands on his back. Auntie M grabs Owen to comfort him post-splash. It didn't take long before he was back to splashing and jumping. He's a water baby (or water kid, he prefers). Pa calls him a water dog. Tomorrow will be his 5-year-old pictures at Sears. Beth has a series of photos each year around his birthday of him w/ a white number corresponding to his new age. Really cute, but then I'm partial. We'll also be going to see Aunt Norma Lee in Frederick and basically kicking around southwest Oklahoma. Our flight is Monday at about 3 p.m. from Lawton - hurray for no 2-hour drives to the airport! Last night I found a journal from 03-04 that included when I first met Shawn (one of the few books left here - most others are in NYC). Reading some of the entries before that was cringe-worthy - I mean I was really psycho. I guess I was even that way in tracking down Shawn after we met. I'm not sure if I've mellowed, if it's just a factor of aging/growing up OR if I'm just incredibly lucky to have found someone who perfectly balances me and can put up with my crazy interludes. Probably a combination. Whatever it is, I'm very grateful! Not that it's NaBloPoMo, but here it is the third of Sept and I've had three posts this month. What, what?! Free advertising on my blog. How about that, Budweiser?! Posting this on Shawn's computer in my teenage bedroom (we added on when I was about 12 so Beth and I shared the dining room as our bedroom when we were kids). Probably the first blog post from here, although I did have a laptop w/ dial up on at least a few trips home ... but I didn't really blog my college years in a public way. Seems like not too long ago I was "celebrating" my 500th blog post. Here we are at 600. I think I'm getting more regular in updates BUT not necessarily better in content. Certainly not better in traffic or AdWords revenue (to be honest I've never earned enough to get paid!) ... but I have a nice history for myself and my family. I probably get the most benefit from the blog. Lunch with Gran today. She has Women's Circle this afternoon, then choir practice and prayer meeting tonight. Beth has a meeting after school and my mom works at the library tonight. 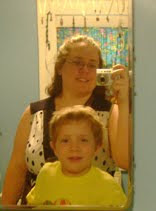 So Shawn and I will be picking up Owen from school and hanging out for a bit. Papa John's pizza is on the menu tonight - there isn't one near us in NYC (although they do exist there, they just won't deliver to our area). I've also been drinking more than my share of Sonic and Wayne's drinks - diet vanilla Coke, if you please. The people of NYC don't know what they're missing by not having the ability to get a quality fountain drink. If there's a place to get it, I haven't found it yet! Last night we swam at the apartment. Owen is FEARLESS. He didn't even check the temperature of the water. Just plugged his nose and jumped in (he does wear a life vest/floatie apparatus). It was freezing, but Uncle Shawn and I did get in with him. Shawn threw him in the water a lot, which was fun. I have pictures, but the camera is at Beth's. I'll try to add the funniest one soon. 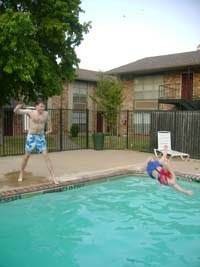 Owen was pleased with every throw except one, when Shawn LAUNCHED him into the water from pool side and Owen landed on his back. Poor kid! He came up crying, but it didn't last long and he was back to swimming and asking to be thrown (from inside the water though). Maybe we'll swim again today. We got Owen's hair cut yesterday too - he looks much more grown up and so so so cute. We've also been watching his new Titanic DVD - an Amazon find from Auntie M. I also got him a giant cut away book - you can see inside the ship and look at all the decks. What other 5 year old is so fascinated with a sinking ship? He is funny. I guess this is just a lesson in learning patience. I get the concept, but I am really unable to put it into practice. I want things fast and I want them now, especially when it comes to work that I like to be able to produce. Maybe I should just slow down and take it in. We are in Oklahoma after all, home of a draaaaaaaawl like you wouldn't believe (noticed a lot on the plane, but since I've been here it's less obvious to me). My 2003-era laptop continues to surprise me with how it can mess up. The latest being that the enter key doesn't work. If I want a line break or paragraph break - better hit up copy and paste (thankfully that works ... something that wasn't always true/this laptop would paste a screen shot instead of what you actually copied). The laptop's USB ports don't recognize my memory key. And my mom's laptop doesn't have PPT or Excel, two key ingredients to my work success. So I've had to e-mail the files from the memory key to my laptop. I am able to VPN to the work network on my mom's computer to get the files I (inevitably) forgot to put on the memory key. The laptop just has lots of problems, and I hope to put it out of its misery soon. Although I guess it could be reformatted if it was totally wiped and re-set. We'll see. But thank goodness the programs I need work and that I can access the Internet via Ethernet (wireless doesn't work with this network/laptop combo). Picking up Owen from Kindergarten is pretty great - the best feeling when he spots you and realizes he gets to come home! He has little friends and told one of them "This is My Mari" ... what a sweet boy. I got to spend a couple hours with a friend from way back - and holding her new baby daughter. Wow. So that was pretty great and I hope to see them again before we leave. Shawn should really have a chance to hold a baby that tiny. I just hope we're lucky enough to get to have a baby of our own. I'm an early worrier, and this is no exception. This afternoon will be crocheting with Gran before picking up Owen ... then a haircut for him, groceries and dinner at Beth's.